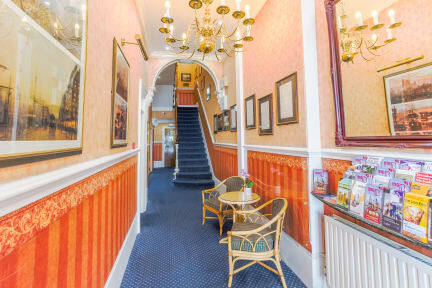 The London Town Hotel is your ideal hotel for exploring and visiting London. With excellent transport links, London's tourist attractions, London's museums and art galleries, West End Theatre shows, London's celebrated restaurants and London's famous department stores, shopping streets and markets are all within easy reach. Our friendly and helpful staff, look forward to welcoming you at the London Town Hotel. Our rooms provide a comfortable space to relax, work and sleep, making us the perfect hotel for your visit to London. Our elegant rooms have luxurious 1000 pocket spring beds, digital TV & radio, central heating, hairdryer, telephone, small room safe and free WiFi. Our spacious guest's lounge has complimentary tea & coffee making facilities and free WiFi. The lounge leads on to our terrace overlooking the garden. The London Town Hotel is located in the centre of Earls Court in the Royal Borough of Kensington & Chelsea, minutes away from Earls Court London Underground Station. The London Town Hotel is moments away from a wide variety of local restaurants from around the world, and friendly neighbourhood pubs. Earls Court Station is served by the Piccadilly and District London underground lines. Heathrow airport is only 45 minutes away and St Pancras International Station for the EuroStar is only 25 minutes away, via the Piccadilly line. The hotel is ideal for those visiting the Olympia Exhibition Centre, which is 1 stop away.